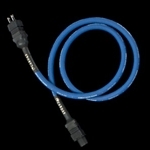 The Cardas Parsec Power cable is ideal for front end components as well as power amplifiers! The Cardas Clear M Power Cable is a smaller version of its big bro - the Clear Beyond. The Cardas Clear Power Cable is a State of the Art power cable! Cardas Clear Beyond Power Cable is state of the art for power cables!